The “Miguel Agustín Pro Juárez” Center for Human Rights, which has for years accompanied the Tila ejido of Ch’ol persons in their actions before the Supreme Court, expressed in an Urgent Action that “we hope that by exercising their constitutional and legal rights, this conflict in the Tila municipality of Chiapas be resolved through mediation, and that the state’s reaction not be through criminalization or repression of any kind.” The Center requests that civil society send this Urgent Action to the officials who appear in the document, with copies to accionesurgentes@centroprodh.org.mx. The CED has deeply questioned the Mexican State in relation to the actions and policies supposedly designed to prevent, investigate, and sanction forcible disappearances, as well as to search out the missing and protect their families. In this sense, the Committee interrogated the State regarding the reasons for the closure of the FEMOSPP, an institution that had been charged with investigating the grave human-rights violations that took place during the “Dirty War” of the 1970’s, as well as the lengthy delay of the federal government in attending to the case of the forcible disappearance of the 43 students from Ayotzinapa. 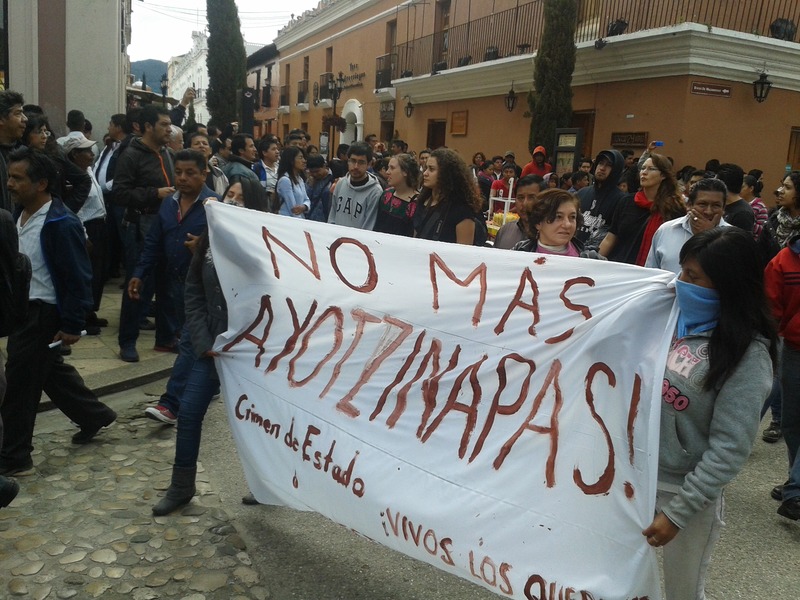 The CED indicated that the Ayotzinapa case represents a serious challenge for the Mexican State, but that it also demonstrates a broader structural problem that has developed due to impunity. Stephanie Erin Brewer, coordinator of International Affairs at the Miguel Agustín Pro Juárez Center for Human Rights, has indicated that the question of impunity has been present at all moments, given that the members of the Committee have indicated that there are exceedingly few cases in which sentences have been handed down. She inquired into the reasons behind the closure of the Special Prosecutorial Office for Past Crimes and other events, such as the faulty classification of this type of crime. The conclusions and recommendations for Mexico will be made public on 13 February. 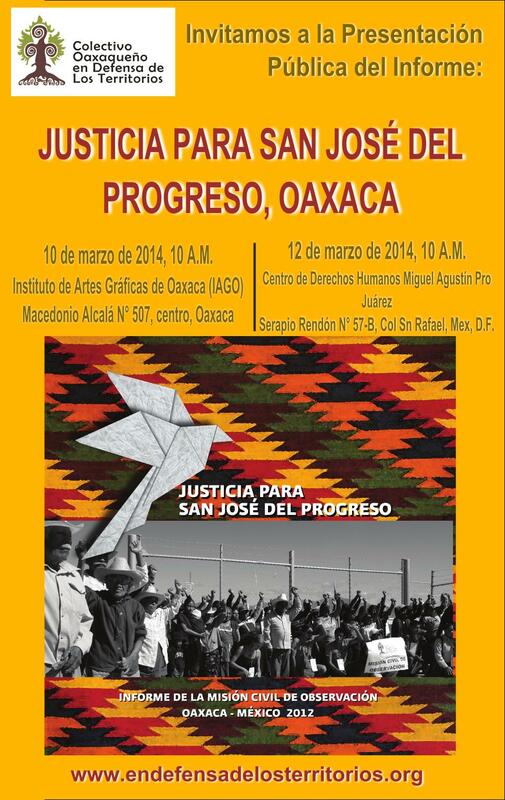 Coinciding with the second anniversary of the murder of the anti-mining activist Bernardo Vásquez Sánchez, the Oaxacan Collective in Defense of Land will publicly present the report of the Civil Observance Mission: Justice for San José del Progreso. The Mission, in which SIPAZ participated, was held in November 2012 in the community of San José del Progreso. Since the year 2006, this community has denounced human-rights violations committed by the Fortune Silver Mines company, which is implementing a mining project there. The presentation of the report will be held on 10 March at 10am at the Institute for Graphic Arts Oaxaca (IAGO) in Oaxaca de Juárez, and thereafter starting on 12 March at 10am at the Miguel Agustín Pro Juárez Center for Human Rights (Centro Prodh) in Mexico City. On 1 April was expected the decision of the Supreme Court for Justice in the Nation (SCJN) regarding the case of the Tila ejido. The ejidatarios had petitioned the maximum tribunal of justice to restore to them the 130 hectares of the ejido which had been expropriated in 1980 by the state government of Chiapas. However, following what previously had happened, the SCJN justices decided to postpone their decision. The request had proposed that the legislative and executive powers in Chiapas nullify the decree of expropriation, but this was rejected by the majority of the ministers. The case has been reitred and will be presented once again in a few weeks by the justice Olga Sánchez Cordero, who must now unify the arguments of the justices who opposed the motion on this occasion. The Tila ejidatarios, upon learning of the SCJN’s decision once again to postpone decision on the case, released a communique in which they warned of the possibility that new violations of the rights of the Ch’ol people be prosecuted. They indicated that the justices “do not know our people […]. We have already said that the large majority of those who live in Tila are families of ejidatarios that form a part of our assembly, and that those who are not will have their right to possession recognized. We also want to say that many state and federal constructions are recognized by acts of donation for some time.” The Miguel Agustin Pro Juarez Center for Human Rights (ProDH), making reference to the different arguments presented by the justices in the discussion of the case, expressed that “Deliberations on the nature of an indigenous people should not imply a dichotomy between being ejidatario or indigenous; rather, both dimensions coexist, that is to say, they are both indigenous and ejidatarios. At the Court there were voices postulating the necessity of defining whether the case of the Tila ejido is an agrarian question or an indigenous question. Far from being exclusionary, the social regime of ejidal property and the rights contained therein are broadened and strengthened by the exercise of the rights of indigenous peoples, when these be recognized.”In recent dates, the ejidatarios denounced that within the context of the SCJN’s decision, municipal and state authorities have intimidated ejidal authorities. “In the home of the ejidal commissioner, personnel from the state police with members of City Hall have arrived, waiting to see if the commissioner is at home. The second time, there were judicial police carrying videocameras, thus communicating to the people that the commissioner feels intimidated. This occurred at the beginning of the month of March,” as two ejidatarios have said. During the final week of March, they indicate in a denunciation, harassment worsened: “There is no peace in Tila, but rather violence is beginning, and aggressive behaviors are resurging, as in the period of the numerous massacres carried out by Paz y Justicia.” In the denunciation, ejidatarios recall several acts of aggression, intimidation, and injustice they have suffered on the part of municipal authorities since the end of the 1970s to date. 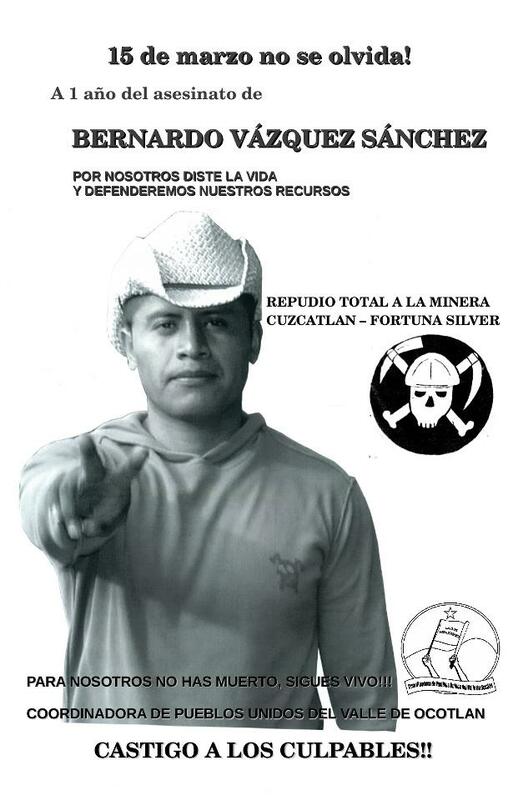 15 March marked the one-year anniversary of the murder of Bernardo Vásquez Sánchez, spokesperson of the Coordination of United Peoples in Defense of the Ocotlan Valley (CPUVO) and opponent of the “Trinidad” mine owned by the Cuzcatlán firm, which is a subsidiary of Fortuna Silver Mines Inc, located in the municipality of San José del Progreso. During 2010 and 2011 Bernardo and members of the CPUVO received death-threats for which they responded with 20 juridical demands, none of which was processed. Commemorating the one-year anniversary of Bernardo Vázquez’s murder, on March 15 a group of 200 people carried out a ceremony to remember this social activist, before the very site of the Cuzcatlán mine in San José del Progreso. In accordance with the Miguel Agustín Pro Juárez Center for Human Rights (Centro Prodh), the entire group was arrested following their public act. These events took place when members of a group supportive of the mine (transported in 5 trucks) blockaded access, including federal highways, to inhibit the free movement of the protesters, who were also fired upon so as to intimidate them. There were no reports of injured persons, but among those arrested are found members of the Oaxacan Collective in Defense of Territory, of the CPUVO, residents of San José del Progreso, and members of the Miguel Agustín Pro Juárez Center for Human Rights, including its director, José Rosario Marroquín Farrera. “A year after his murder, the violations of the collective rights of the people continue to be prosecuted by the mining firm, and there has been no institutional means by which to resolve this conflict. This date leads us to recall the level of impunity with which the mining firms are operating; it also recalls the complicity of municipal, state, and federal governments with the implementation of these projects,” as is noted in the communique by REMA (Mexican Network of those Affected by Mining) that was published for the one-year anniversary.